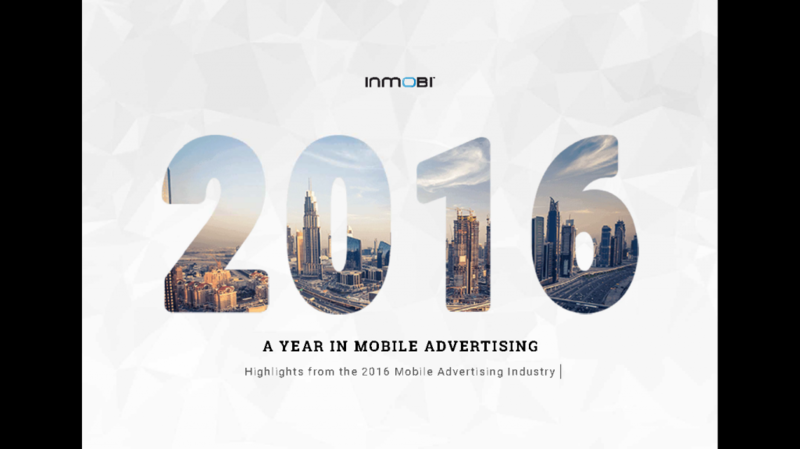 We are delighted to share with you the first annual edition of the InMobi Yearbook! This yearbook captures 2016’s key mobile advertising developments, changes in the industry and highlights how these changes will shape the coming year. Advertisers and publishers can now create a winning game plan for 2017, equipped with powerful trends gleaned from InMobi’s vast network, award-winning creatives and deep insights from industry leaders. In 2016, video was the fastest growing ad format available to marketers, charting over 150% growth in ad spend and 200% increase in consumption. Additionally, marketers around the world allocated 24% of their digital ad spend to mobile video , confirming that ad dollars follow user behaviour. By delivering unparalleled results - 4X higher user engagement and 2X higher conversions compared to static formats, it is not hard to see why video was the preferred choice amongst marketers. The app ecosystem is reaching a ‘tipping point’, and app developers are considering user retention to be as important as acquisition. Nearly 50% of all app marketers across the world adopted app retargeting as a means of engaging users in 2016 , and many more intend to allocate budgets in the next 12 months. On the InMobi network alone, mobile remarketing adoption surged by 400% across the first 3 quarters of the year. With retention rates as low as 6% on Day 30 after an app install, mobile app remarketing is proving to be indispensable. In the march towards achieving greater efficiency, control and transparency, 75% of all marketers adopted programmatic in 2016 and 33% of them have been doing so for over 2 years . Currently, advertisers based in North America account for the largest share of mobile programmatic ad spend. Interestingly, In H1’16, 85% of the mobile programmatic spend on the InMobi network came from Fortune 500 brands. Growth in programmatic adoption is expected to come video ads as 44% of marketers preferred to buy video via programmatic. Asia is a vast and diverse region where mobile user behaviour and preferences differ in each country. China’s digital ecosystem is mobile-first and users exhibit a high degree of mobile maturity compared to the west. This will continue to grow as by 2020, mobile is forecasted to account for 84% share of total digital ad spend . In India, on the other hand, mobile accounted for only 3% of the total media ad spend, which is expected quadruple to a 10% share by 2020. Ad spends in the market shifted from pure app installs and user acquisition to user retention and high LTV. Southeast Asia is a eclectic mix of mature market such as Singapore, and the trailblazers like Indonesia and Malaysia which are driving growth in the region. Declining smartphone prices coupled with improved 4G coverage is encouraging a mobile-first digital ecosystem. 2017 is sure to be another stellar year for mobile advertising and the industry will continue to build on these themes from 2016. For more details on award winning mobile-first creatives, opinions and thoughts from industry leaders and case studies, explore the Yearbook online right here. For future references, you can also download the full copy for yourself.